Signage/ Enseigne magnifies institutional bureaucracy around use of biological based materials while also highlighting the inherent biohazardous nature of the human body. It also exploits the idea of ‘artist as contaminant’ in its performance/ artifact of performance aspect. Signage indicates a pairing, more than one sign. Enseigne, the French-version word with multiple meanings, references the relationship between signifier and signified (Saussure). In this case, the signifier is the adhesive vinyl sign, while the signified is the bodily reference made literal in the garment version of the sign. 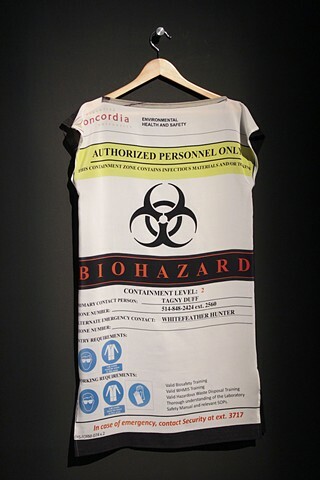 Digitally printed biohazard warning sign on silk charmeuse, worn/performed during the exhibition opening.